State Farm maintains status as most active sponsor; Anheuser-Busch in distant second. Chicago, Ill. – Sponsorship spending on the National Basketball Association and its 30 teams totaled $861 million in the 2016-2017 season, a 7.8 percent increase from the previous year, according to ESP research. The increase lags the 8.1 percent increase in the 2015-2016 NBA season but exceeds the projected 4.3 percent increase in overall 2017 sports spending and 4.1 percent increase in overall North American sponsorship spending. Autos made a strong showing in the 2016-2017 season. Fueled by the growing trend of non-exclusive deals, the auto category was the second most active category sponsoring the NBA behind insurance, the league’s top category. Autos did not make the top ten sponsor list in the 2015-2016 season. Telecommunications also joined the top ten list of most active categories, but just barely (10th place). Travel and non-alcoholic beverages both dropped off the list. Fueled by its league sponsorship and deals with the majority of teams, State Farm is the most active sponsor of the NBA. Eighty-one percent of NBA properties with a sponsor in the insurance category report a partnership with State Farm. And the future looks rosy for the pro sports league. The NBA is expected to see increased sponsorship spending as a result of its new apparel deal with Nike and growing number of first-year jersey deals. “While sponsorship spending in the NBA remains healthy, spending is expected to skyrocket in the upcoming year,” said William Chipps, ESP Sponsorship Report senior editor. 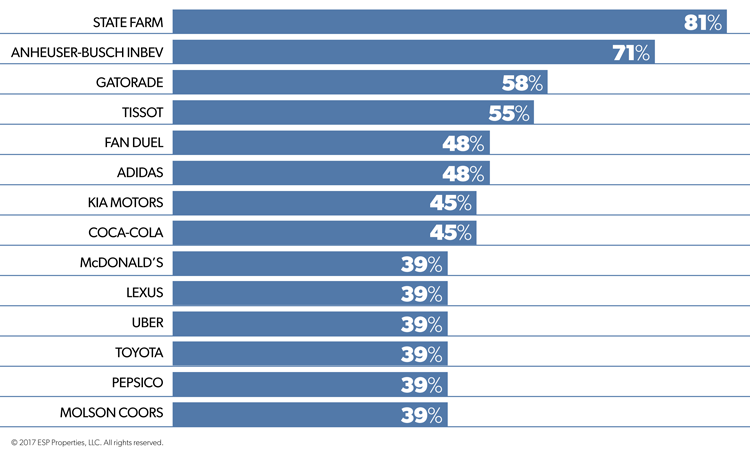 Insurance companies are four times more likely to sponsor the NBA than the average of all sponsors. Eighty-one percent of properties with a sponsor in the insurance category report a sponsorship with State Farm.